"I never saw a more magnificent or more awful sight"
Bell Dunnington, the daughter of University Professor Francis P. Dunnington, was twelve years old at the time of the Great Fire. She recorded her eyewitness account on Monday, October 28, 1895 in a letter to her older sister Sadie, who was a student at Hollins Institute. 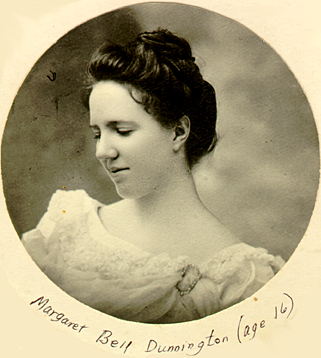 The photograph of Miss Dunnington at age 16 is courtesy of her niece, Mrs. S. J. Gamble of Harrisonburg, Virginia. By the time you get this letter you will have heard of the dreadful fire we have had here; and how the dear old Rotunda is all burned down, and nothing left standing but the walls, the front and back porches, and some blackened pillars. The first alarm was at about half past ten oclock yesterday morning. The fire began up in the roof of the back porch, just behind the drawing room. Most people think that it started from two electric wires that went in there; but no one has been able to tell certainly yet. I had gone down to Sunday School and the rest of the family were just about to start down town for church, when Cousin Mary noticed several students running toward the Rotunda, and Papa ran right on over. The others went after him and saw a little thin smoke coming out from the end of the roof of the back porch corresponding to the clock on the other end. Cousin Mary said that she felt sure that it would be put out very quickly and not very much damage done; but though they got the University hose up there very quickly they could not get any water. They then tried to go up in the drawing room and put water on from the inside; but Papa said that they could barely get to the top of the steps for smoke, and the drawing room was so full of it no one could possibly get in. By this time a great many students and professors were getting the things out of the Library and other rooms of the front part. They tried very hard to get out The School of Athens and had it all undone but one corner when they were obliged to go and leave it. We were all so sorry they did not tear it and bring what they could, for only a little corner would have been lost. Nearly all of the pictures, the statue of Jefferson, and Mr. Minor's bust were saved. Carrie came down town after me, and we got up a little after eleven. They were very busy getting out the books when we arrived. They carried them in their blankets, comforts, mattreesses [sic], baskets, and anything else they could get. Beside the ones who brought them down on the Lawn there were lots who gave the books they brought to the ladies who were out on the steps and they carried them out on the grass. The middle portico was blown up with dynamite, in the hopes of stopping the fire there. But they were unsuccessful and the Annex was soon burnt down and the fire caught the Rotunda. I never saw a more magnificent or more awful sight than when the dome caught fire. All of the top part of it was one terrible, glowing mass of flame, and the tin had a curious reddish look, though it did not blaze, but wrinkled up. Every student in the University must have been there and I never saw anybody work as they did. Everybody nearby that was up there worked. We moved all of the books that were gotten out, three times, farther and farther away down the Lawn, and also the desks and other things They tore part of the rooves of the Old Chapel and the Reading Room off and blew up a good deal with dynamite to keep it from spreading to the dwelling houses and dormitories. But nothing could have saved all of the houses if the wind had not been coming from the south-east. That blew the fire right away from the Lawn, but towards Carr's Hill and all over this way. One of Dr. Chancelor's stables caught on fire, but he was over here watching and soon put it out. Some grass and one tree caught on Carr's Hill, and right along the edge of the Campus. Papa came back over here to our house, and fixed the hose up into one of the garret windows so that he could turn it right on if anything should catch up there. He put Frank to watching around the yard in case a spark should light on some of the dry leaves around and start a fire. I do not think Frank was very sorry not to be over by the Rotunda, for the terrific explosions of dynamite scared him a little, Cousin Mary said, though he wouldn't say they did. Cousin Mary was very sorry not to be able to stay over on the Lawn, but she was obliged to come home to see after Aunt Lucy, who had gone over home a little while before. She found her very weak and faint and hardly able to get her breath. But fortunately Papa had been here and had given her a little whiskey and water, and she soon began to get better, and in a little while she was well enough to walk slowly home with Cousin Mary. P.S. Papa is going to send you the copy of the "Progress," telling all about the fire.